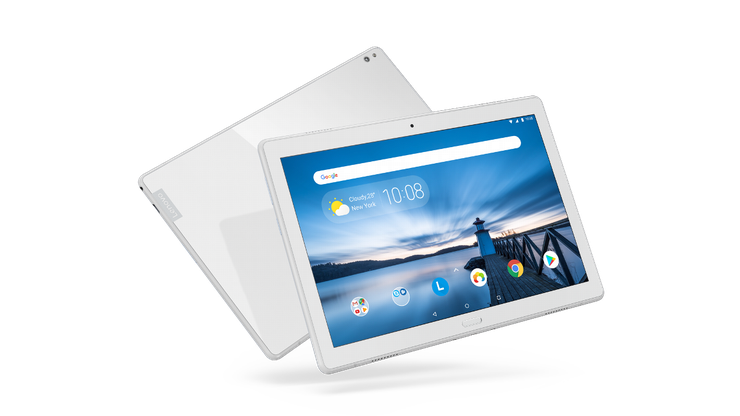 The entry-level Lenovo Tab E7 houses the Android Oreo Go Edition, which means lighter apps, more storage out of the box, and improved performance, according to Lenovo. It has a 7”, 10.33mm frame and lasts up to 5 hours without charging. The Lenovo Tab E7 will be available from September for $99. The Lenovo Tab E8 allows for multiple dedicated profiles, interface and storage. The tablet has an 8” HD display and a Dolby Atmos supported front speaker. The Tab E8 is 8.9mm thick and weighs 320g, and offers 10 hours of battery life. The Lenovo Tab E8 will be available from September for $149. This Lenovo Tab E10 packs two front speakers with Dolby Atmos and a 10-inch HD display, along with the Qualcomm Snapdragon 210 processor. The Lenovo Tab E10 comes with 5MP auto focus rear cameras and 2MP fixed focus front cameras. The Lenovo Tab E10 will be available from November for $199. The Lenovo Tab M10 features Qualcomm Snapdragon Octa-Core 1.8GHz processors, 10.1-inch Full HD display and Dolby Atmos support. Families with kids can get the optional Kids Pack that comes with a custom shock-resistant bumper and special kid’s mode that features up to date and curated kids content. The Lenovo Tab M10 will be available from November for $349. The Lenovo Tab P10 is 7mm thick and weight 440g. The tablet is equipped with an 8MP auto-focus rear camera and 5MP fixed focus front camera. It features a fingerprint sensor that allows multiple users to log into their own personalised tablet experience. The Lenovo Tab P10 will be available from November for $449.